On the scale of bad weeks to good weeks, this week could rank as pretty rotten. In the past seven days I have lost three baby goats and two baby pigs. Peyote got the bad news that she had to have her leg amputated and the floor of my dairy is proving to be a money pit. I was also the proud recipient of not one, but two flat tires, all in the span of four days. The second flat was harder to remedy since the spare was still replacing the first flat (don’t worry Mom, I now have four brand new tires). The first time Peyote and I ended up stranded on the side of the freeway. The second time I was alone (thank goodness) but my phone was on it’s last battery bar. I wasn’t to worried since I had managed to steer into a cute little housing development with lots of freshly manicured lawns and nice cars in the driveways. I was able to call AAA and blurt out my information before my phone died, and so, while waiting, I went on a walk to see if I could get someone to charge my phone for me. I had my charger in hand so I figured it would be an easy fix. I knocked on twenty-four houses. A few of them had latchkey kids answer the door so I quickly turned around since I didn’t want to put them in an awkward situation with speaking to a stranger while their parents were out. But, most of them were adults. Grown people, just like me, who, when I asked if they could just plug my phone in while I waited for the tow truck, they told me they didn’t have a computer, or all their outlets were full, or just plain no. To be clear, I wasn’t asking to come in their house. All I wanted was to hand them my phone and have them plug it in. I might as well have been asking for the moon. The irony of all this, is that nestled in their artsy front yard displays were really pretty statues—angels, Buddah, rocks about love and friendship. And yet, when given the chance to help a stranger who a) isn’t scary looking and b) was clearly in need of help since my giant farm truck was beached at the front of their development, not one of these people took a chance. The other day I walked into our local coffee shop with my spotted goat sidekick. 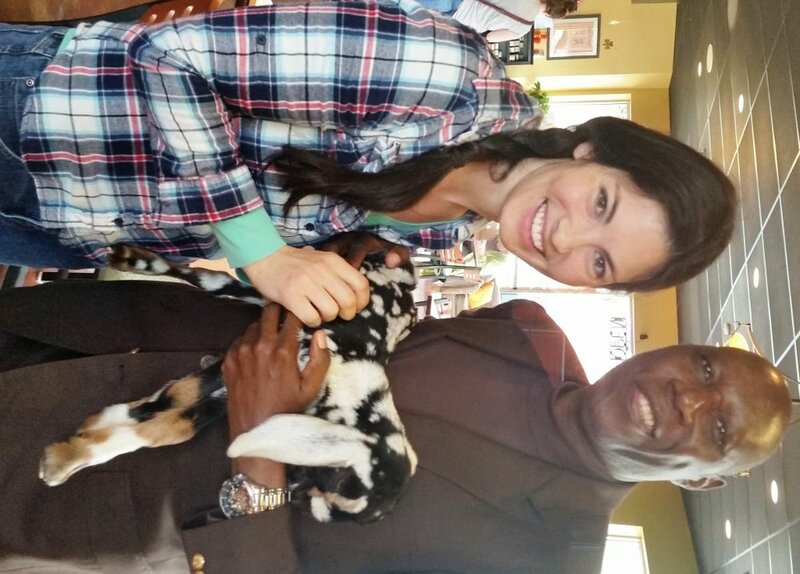 A gentleman approached me and let me know that his guest was from Africa and really wanted to meet my goat. I never say no to the chance to talk about goats and so I went over and sat with them. It turns out the American was Chairman of the Non-Governmental Organization, Friendly Water for the World and the other gentleman, Prosper Ndabishuriye, was the founder of JRMD, which is working to rebuild the nation of Burundi—a community that has been the victim of genocide, civil war, and political unrest. Burundi is one of the five poorest countries in the world. I’m not ashamed to admit, before that day I had never heard of Burundi. I got an education that day, and I’m grateful for it. I didn’t have a bad week. Throughout the course of this week I was never once concerned for my safety or the safety of my daughter. I had a warm bed to sleep in and I always knew where my next meal was coming from. This week has taught me that farming is really just an exaggeration of life. The polar highs that we feel when we save a life, or witness a birth are always teetering on the next incidence of the lives we cannot save. Farming magnifies our emotions because we are normally sleep deprived and almost always doing too many things at once. At 3 am, when the alarm goes off to check on the baby pig who didn’t get a chance to suckle, when the warmth of our pillow is almost like a magnet to our sleep weary head, farming reminds us that we are alive and we are present. I don’t know about you, but I’d much rather be present for this life than just coasting by. I may not be able to save everyone, in fact, I know I won’t. But every time I witness a death I am reminded that the time we have on this Earth is finite. What we choose to do with it is ours alone. I choose to get up in the middle of night and check on mama goats on the verge of giving birth, to spend my money amputating a goat’s leg instead of putting her down, and to share the life and death of this farm with my daughter, so that maybe, one day, she too will understand that you cannot have happiness without sadness, but that in the end each emotion is welcome since they remind us that we are alive. And also, for the record, if you ever need to charge your phone, please come to my house. Not only will I plug it in for you I’ll even offer you a glass of fresh goat milk.